Looking for An Electrician in Pearland, Friendswood, Seabrook, Clear Lake, League City, Alvin or the Houston Area? 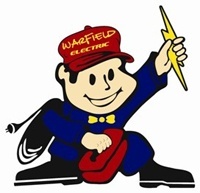 Warfield Electric is an electrical contracting company specializing in residential and commercial electric service and construction. Our primary focus includes residential and commercial electrical service repair, commercial lighting services, new tenant build-outs, lease spaces, parking lot lights, panel change outs, breaker replacement and installation, generator installation, surge suppression systems, commercial and residential remodeling and electrical troubleshooting. And for fun, we offer underwater fishing lights, also known as green lights. Check the "green lights" out for all your friends and family who own a property on the water! What do you look for in an electrician? Do you ever wonder where the "service" went in your electric service call? Have you ever called for electricial service and then weren't sure you wanted to let the electrician in the door? Do you expect your electrician to be knowledgeable, service oriented, punctual and polite.....not to mention reasonably priced? Our business is built on your repeat business and your referrals. We want you to be satisfied! We are licensed and insured and many electrical service calls can be made the same day!. 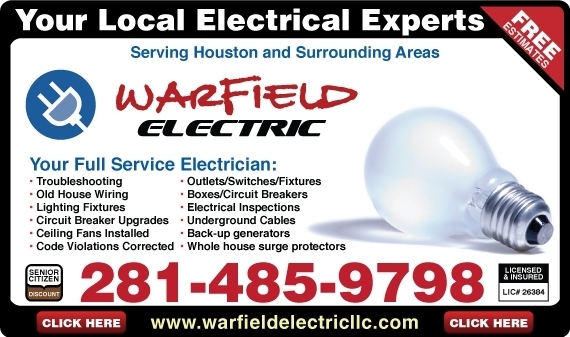 Warfield Electric is a full service electrical contractor serving Houston, Clear Lake, Seabrook, Pearland and surrounding areas. Please call us for all your electrical needs! We want to be Pearland's most "referred Electrician".